Remove the puff pastry from the freezer. Mark and cut the puff pastry into 12×6 cm rectangles. This will yield 8 small puff pastries per sheet. Thaw the puff pastry and dock the dough with a fork to prevent it from puffing up. Bake at 180 degrees Celsius until golden brown, 15 to 20 minutes (or just follow the instructions that you have on the package). Remove from the oven and cool on a rack. To make the lemon mousse, combine the lemon zest, juice and sugar in a saucepan. Bring it to a simmer, stirring occasionally. In a small bowl, beat the eggs until light. While beating, pour in a little lemon mixture, to bring up the temperature of the eggs, you will not, defnitely, want to cook the eggs. After tempering the eggs, scrape the mixture back into the saucepan and cook, stirring constantly until it thickens, about 5 minutes. You will know that it’s done when the custard coats the back of the metal spoon. metal spoon evenly. If you want to be 100% sure, pull your fingertip through the coating on the back of the spoon – if it leaves a clean path, it’s done. If not… continue cooking! Strain the mixture and let it cool to room temperature, if not using immediately, cover with a clingfilm until ready to use. Whip the cream until medium stiff peaks form, fold in the whipped cream into the lemon mixture in 3 portions. To assemble, place a puff pastry rectangle on a serving plate, spoon or pipe (I choose to pipe as it is neater) a layer of lemon mousse on top of the puff pastry. Top with strawberries (normally 3 strawberries will be needed per rectangle). Pipe a little mousse on top of the strawberries (I use it as a glue) and place the second puff pastry rectangle on top. Pipe another layer of mousse and top with a generous amount of blueberries. Top with a little mousse-glue and then end with the last puff pastry rectangle. 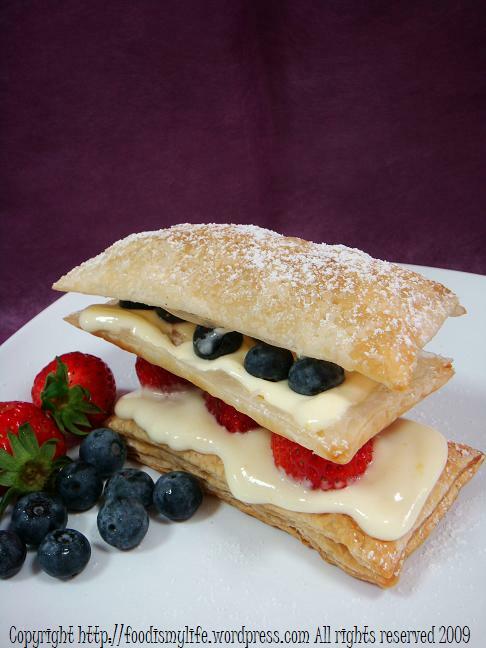 Serve immediately, dusted with icing sugar and more fresh fruits. P.S. You can always use a combination of other fruits! Haha sure sure no problem! (= Whatever you want, as long as I can bake, I will bake it for you! (= SO hurry hurry come back okay!! Well done! They looks delicious!